From day one of the Bryntum Scheduler development, our goal was to be framework agnostic and integrate easily with any framework and environment. This means it can be easily used with any codebase, including Vue.js and in this blog post I will describe the basic steps to integrate the Scheduler with Vue. Let’s get started! 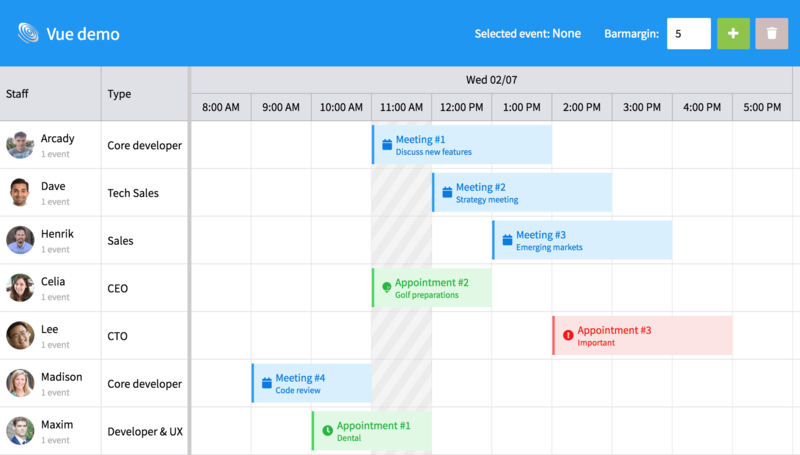 The Vue demo included with the Scheduler contains a Vue component called scheduler that uses the Scheduler as its engine. In this post we will outline the steps needed to add it to your project and also take a look at how to use it. To see the full demo in action, visit https://www.bryntum.com/examples/scheduler/vue. Copy scheduler.js from /examples/vue/components to your project. Copy scheduler.umd.js and the css for the theme you want to use from /build to your project. 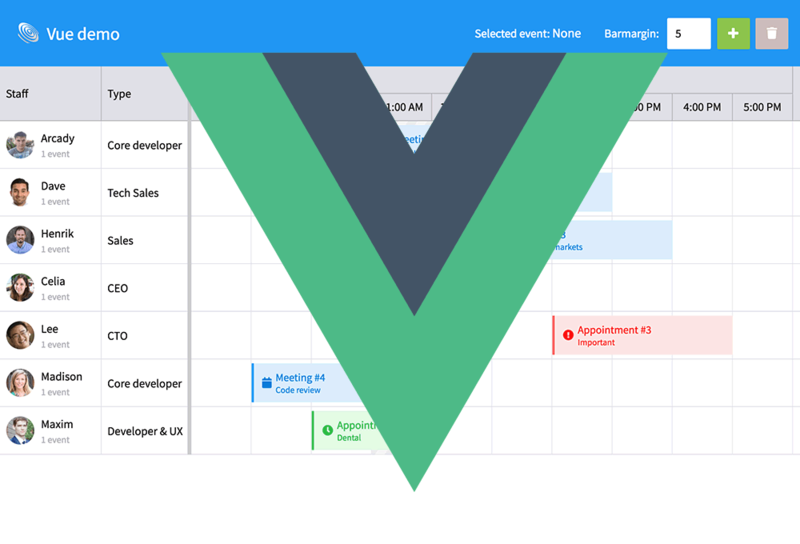 The best way to learn more about the Vue Scheduler component is to examine its source and the demo. And to learn more about the Scheduler API, please visit the docs. If you have not already, please download our trial version and check it out. The Bryntum Scheduler works with Vue.js out of the box and ships with a demo containing a Vue component. And although the Vue component does not wrap all functionality in Scheduler, you can always access the engine to use any part of the API.